Why do I do this to myself? 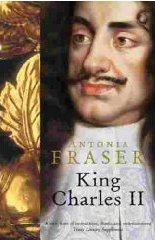 I seem to have collected a large amount of historical biographies over the years all of which could double as doorstops and they are long and somewhat arduous to read- happily, Antonia Fraser does her best to ease the pain and dullness and makes her biography of King Charles II a fairly engrossing read. Why King Charles II? Well, I've had this long-standing desire to wrap my head around the English Civil War (or wars, in this case) as I've got a decent grasp of it's American counterpart but couldn't for the life of me figure out the complexities of Cromwell, Charles I and Charles II and how they all figured into the whole ball of wax that was the English Civil War. * I've got a biography of Cromwell waiting in the bullpen (also by Ms. Fraser) but wanted to start here to see if I could get a grasp of the guy who not only survived the overthrow of the monarchy, but came back to England to restore it. So, clocking in at 612 pages this is an astonishingly complete portrait of the monarch and it's revealing in the fact that you see how the experiences of his youth before and during the Civil War helped shaped Charles into the monarch that he became after the Restoration. Loved by his father (Charles I), Charles proved to be a doting and loving father to his children (all of the illegitimate, as he and his wife, Catherine of Braganza were unable to bear children of their own)- but the experience of his father left him with something of a lifelong dislike of Parliaments. After the Restoration, he recognized the political necessity of working with Parliaments, but wasn't about to let them eat into his prerogatives too much either. I also think the prolonged exile Charles experienced after the final Royalist defeat at Worcester helped mold him into a monarch that was markedly more aware of the struggles that everyday people faced than most of his predecessors. Charles spent nine miserable years wandering around Europe and he was poor. Not like 'out of a job monarch poor' but like, 'depending on the kindness of strangers and loans' poor. Real people poor, in other words. The Civil War- or, more precisely, the Three Civil Wars was the crucible of Charles II's life. (TL;DR: Civil War 1: Charles I v Parliament, Parliament wins. Charles I cuts a deal with the Scots who invade and start Civil War 2. Charles gets beheaded and Charles II flees to the continent before signing his own deal with the Scots and starting, you guessed it- Civil War 3, that ended at the Battle of Worcester.) His escape from England to the Continent is the stuff of legend- yes, he really did have to hide in the Oak Tree, but it made him into the monarch that England needed after the Restoration. After years of war and chaos, the Restoration felt like a relief to many and Charles II, if he did anything, stabilized things- at least for a little while. The inability to produce an heir laid the seeds for the Glorious Revolution of 1688- as the issue of his brother, James' Catholicism became politically controversial (he too, converted- but on his deathbed.) Charles may have accepted the need for the continued existence of a Parliament, but it wouldn't be until William and Mary take over after 1688 that the idea of the absolute monarchy ended once and for all. As a biography, this is dense stuff (again, it's 612 pages) but Antonia Fraser's writing style is elegant, poetic in parts and very accessible. It's not a chore to read this- at least for the first two thirds or so. Toward the end of the book when Charles was fending off attempts to pass the Exclusion, I sort of got lost in an avalanche of names- Buckinghams, Sutherlands, Monmouths and the like. But as biographies go, it was informative and readable and you can't ask for much more than that. *I stumbled across the Revolutions Podcast awhile back and have been devouring episodes at a fairly brisk clip, their run on the English Civil War/Revolution was an incredibly helpful enhancement to this book and (as I'm sure I'll discover with Fraser's biography of Cromwell) showed that this Revolution laid some interesting groundwork for the American Revolution of the next century. Plus, it's just an excellent podcast.